Want to build more muscle and strength? Try adding eccentric training methods into your workouts. The eccentric, negative, or yielding (which are all different words for the same thing) portion of a lift happens as the working muscles lengthen and the resistance travels toward the floor. What’s important to know is that eccentric strength can be much higher than concentric strength. And unless a special effort is made to focus on the eccentric portion of reps you could be missing out on gains in strength and muscle mass. There is plenty of scientific evidence to suggest that eccentric-focused training protocols are beneficial. It may be through more muscular damage, higher tension, or more load per motor unit - but the bottom line is it works. There has been a wide range of people from across the fitness and bodybuilding world that have used eccentric training methods successfully. From high-intensity training icon Arthur Jones and bench press champion Rick Weil to author and Olympic weightlifting coach Carl Miller, eccentric work has brought lifters closer to their health, physique, and strength goals for over a century. These men, and a host of others, each had their own favourite methods. This is the most basic level of eccentric-focused training. It seems simple, and it is. 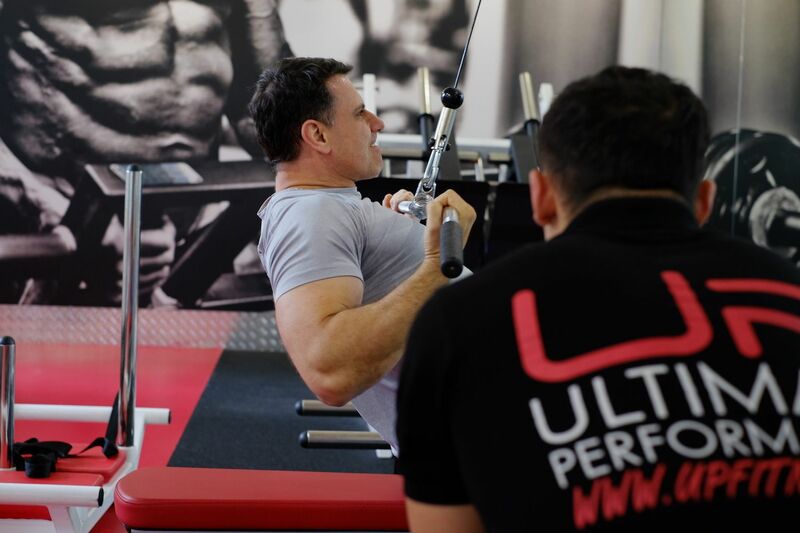 But it will be a drastic change for a lot of lifters as it’s not uncommon to see the average gym-goer complete a set of 10 reps in ten seconds or less. If using a 3-5-second eccentric tempo for the first time, be prepared to use less weight than you’re accustomed to. But don’t worry, you’ll adapt quickly and be back to using heavier weights in no time. And because of the increase in time under tension, you should have some new muscle mass to show for it. This is why a trainer or training partner monitoring tempo and keeping you honest is invaluable. Be cognisant of the eccentric tempo you choose and the length of the range of motion of the exercise. A five-second eccentric tempo works well for a cyclist squat but in most cases is too long for a calf raise. For short range exercises, stay closer to three seconds. Also, take into account your set and rep scheme. Eccentric tempos of 3-5 seconds are great for most strength and hypertrophy protocols. But stick with shorter tempos for special high-rep techniques like 10/10/10 drop sets or strength-endurance rep schemes. Novice lifters can make great progress and should stick with this approach until their training age has increased and they have reached more advanced levels of development. These are pauses performed during the eccentric portion of a rep. Perform the concentric range as usual but when lowering the weight, pause at between one and three predetermined points in the range of motion for 2-10 seconds. This technique increases time under tension and allows the lifter to maintain tension at a specific joint angle. 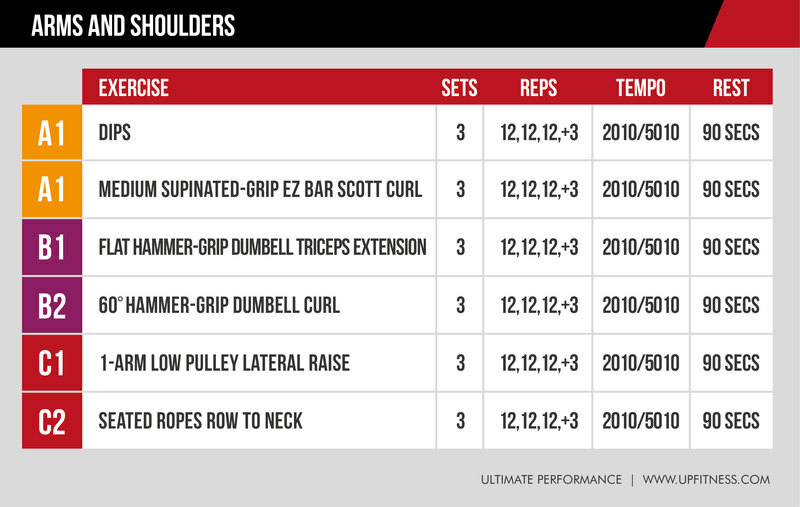 It can be used for each rep of a set or just the last rep of a set. Make conservative weight selections when starting out with this technique. And don’t be surprised by your whole body shaking during the pauses. This technique is adapted from Ellington Darden’s work. Darden was director of research for Nautilus for two decades and also a best-selling author. A few of his titles include High-Intensity Bodybuilding, The Body Fat Breakthrough, and Living Longer Stronger. Super slow means exactly that. We’re talking 10-30 seconds. This is a great way to finish up a hypertrophy session. Use exercises with a long range of motion such as squats, dips, or chins. Try one eccentric rep of 30 seconds. Start with just one set at the end of the workout and build up to three sets over the course of the program. Another option is 4-6 eccentric reps of 10 seconds each. Again, start with just one set and build up. Don’t worry about performing the concentric portion of the range when doing super-slow eccentrics. Use a box, platform, or partner assistance to get to the top of the range. When doing dips and chins, add a weighted belt for more resistance if needed. Choose one of the options and stick with it for 3-6 microcycles. Try the other option with another program down the line. For the concentric portion of reps where you’re weakest, use the mechanically strongest body position or technique. And to make the eccentric portion more challenging use a less advantageous rep style. Swap out a few traditional exercises in your next program in favour of these eccentric-enhanced versions. This style works great with machine and pulley exercises. Use both limbs to lift explosively through the concentric range, brief pause at the top to shift the weight to one limb, and perform a 3-5 second eccentric phase. Reps 1-5: Bilateral concentric. Left limb only eccentric. Reps 6-10: Bilateral concentric. Right limb only eccentric. When using this technique for the first time, use a weight around 10% heavier than what you would use for the unilateral version of the exercise. Increase the weight as needed. This is the most common way eccentric reps are used; so common that 'abuse' is probably a more appropriate word. To execute this technique properly, choose a weight that will allow you to complete 6-12 reps. After you reach failure, you’ll perform 1-2 more reps with light assistance from a partner through the concentric range, and a slow, unassisted eccentric. Light assistance from a partner means just enough help to push through the sticking point. For this reason, an experienced training partner is best. It’s also imperative that tension is kept on the intended muscles for the duration of the set. That means clean technique and no squirming around when it gets tough. Less is more with forced reps. If embarking on a 2-3 month high-intensity, low-volume hypertrophy cycle, save forced reps for the last few weeks. One set of forced reps for 1-2 exercises per workout should suffice. 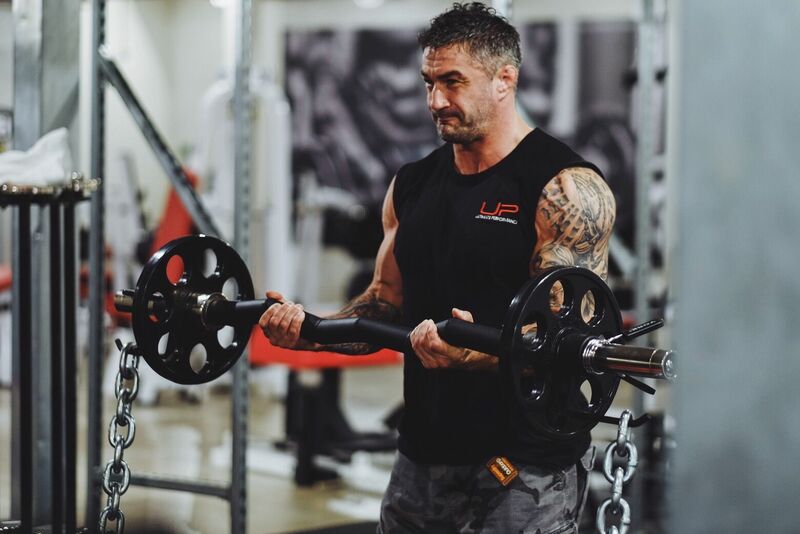 START YOUR OWN BODY TRANSFORMATION FROM JUST £50 A MONTH WITH THE 'LIVEUP ONLINE COACHING PROGRAM. The 12+3 Technique was the cornerstone of The Body Contract Workout. This program was written by Dan Duchaine, and featured in the February 1996 issue of Muscle Media 2000. For this technique, perform a standard set of 12 reps with a quick but controlled tempo. Immediately after rep 12, increase the weight and perform three slow eccentric only reps. Shoot for a five count. For speed and efficiency, it would be best to have 1-2 training partners assist with adding the weights to barbell exercises. The +3 are not forced reps. Don’t struggle through the concentric portion of the range. Your partner should be doing most of the work. As far as weight selection goes, Duchaine recommended a 15% increase for the eccentric only reps. This is a nice guideline, but eccentric strength can vary greatly from one lifter to the next, and even from one exercise to the next. And adding fatigue and lactic acid tolerance to the equation doesn’t make selecting a universal percentage any easier. Try a range of 5-25%, starting on the low end and moving up as needed. 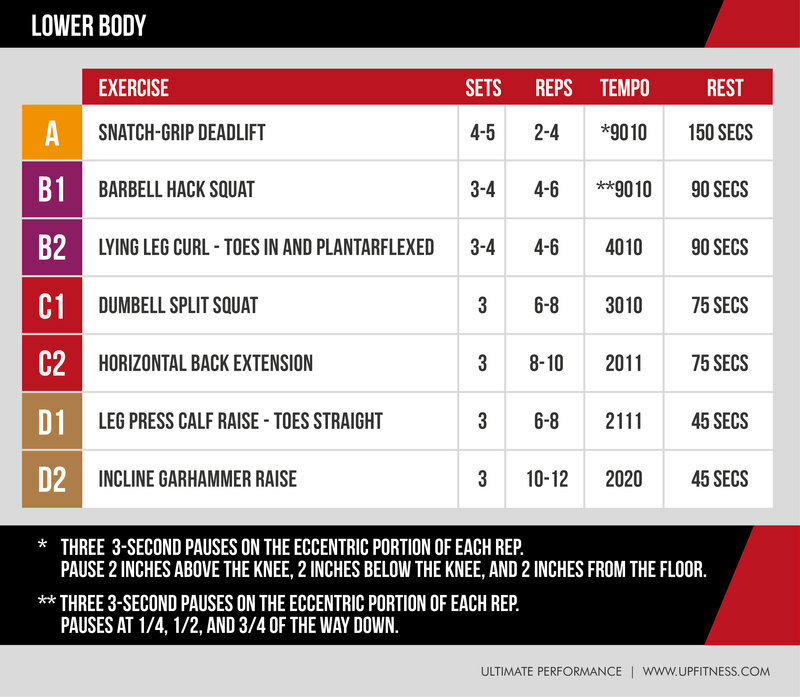 In this example, the first two sets of each exercise are conventional sets of 12 reps performed with a 2010 tempo. 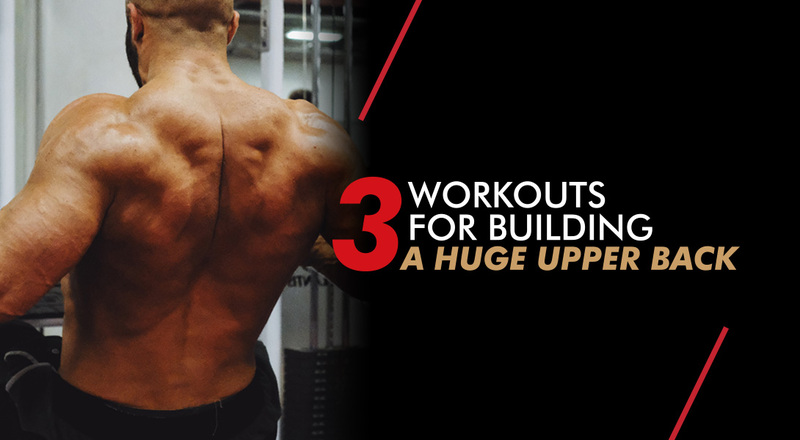 For the third and final set of each exercise, perform 12 reps with a 2010 tempo, then quickly add weight and perform three eccentric reps with a 5010 tempo. Dips: No assistance needed. Add more weight to the belt and step to the top of the dip station to start each eccentric rep.
Scott Curl: Partner assistance needed to add plates and assist through the concentric range. Triceps Extension: No assistance needed. Grab heavier dumbbells, press the arms-extended position, perform an eccentric rep, then roll them forward and press back to the top position. 60° Curl: No assistance needed. Grab heavier dumbbells and using your knees, kick them to your shoulders, as you would for an incline dumbbell press. Lateral Raise: No assistance needed. Use the opposite arm to assist the working arm through the concentric range. Row to Neck: No assistance needed. After changing the weight, simply use a cheating style for the concentric portion of the range. 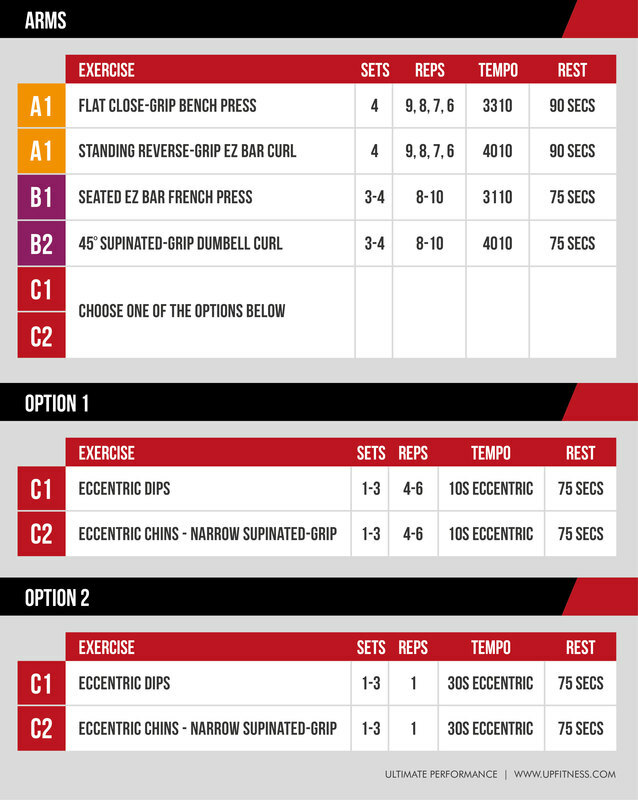 Microcycle 1 – two standard sets of 12, and one 12+3 set per exercise. Microcycle 2 – three standard sets of 12. Zero 12+3 sets. Microcycle 3 – one standard set of 12, and two 12+3 sets per exercise. Microcycle 4 – three standard sets of 12. Zero 12+3 sets. Microcycle 5 – three 12+3 sets per exercise. Microcycle 6 – three standard sets of 12. Zero 12+3 sets. The 4+2 is a close relative of 12+3 and a favourite of strength coach Charles Poliquin. It’s executed in nearly the same fashion, but obviously with heavier weights. Incline Press: A training partner is needed for quickly adding plates and assisting through the concentric range. Chins: A partner is needed to help push through the concentric range. Again, this is a demanding technique. Use the 4+2 rep scheme for one exercise per body part. And gradually build the number of +2 sets over the course of the training cycle. Weight releasers, also known as eccentric hooks, are a training accessory specially made for an overloaded eccentric rep. Weight is added on each releaser and hung on the sleeve of the barbell. The length of each hook is adjusted so that at the very bottom of the range the weight releaser and the added weight detach from the bar and end up on the floor. This makes it possible to overload the eccentric portion of the rep and complete the concentric portion of the range unassisted. This is a great method for developing strength and has been used by many successful lifters, including Louie Simmons of Westside Barbell. If you don’t have access to weight releasers don’t worry, there is an alternative. It just requires two training partners and a power rack. When bench pressing set the safety pins one inch above your chest. If squatting, set the pins just above the bottom position. Perform the negative rep to the pins. From there, your partners quickly remove weight so that you can perform the concentric portion of the range on your own. If doing more than one rep per set, rack the bar for a few seconds between reps allowing your partners to replace the hooks or add plates. When using this technique, perform 3-5 sets of 1-6 reps. The eccentric portion of each rep should be anywhere from 3-10 seconds. This wide range of variables can make weight selection difficult. Start conservatively, maintain total control through the eccentric range, and explode through the concentric range. It’s much safer and more productive to start too light and add rather than vice versa. For the “B” exercise, if hooks are being used, no pause is necessary in the bottom position. After the hooks detach, explode out of the hole, rack the bar at the top, and wait for the hooks to be added by your partners before the next rep. If squatting to safety pins, pause in the bottom position and wait for your partners to remove the necessary weight before exploding to the top. This technique can be extremely taxing for the nervous system. Because of the supra-maximal weights, one bench pressing and one squatting session every 7-14 days using this technique is enough. The rest of the workouts during the microcycle should use more traditional methods. Now we’re talking about pure eccentric work with zero concentric phase to speak of. Simply put, lowering a heavy weight for a single rep. Using a weight heavier than your one-rep max, perform one eccentric rep of 3-10 seconds. A spotter or spotters should do the lion’s share of the concentric work. In the absence of qualified spotters, again a sturdy power rack with safety pins set just above the very bottom of the range can substitute. Strength levels and the number of seconds you choose for the rep will determine the weight. But the majority of lifters will use a weight that represents 105-140% of the one-rep max. After performing several standard sets of 1-5 reps of a given exercise, do 2-4 sets of negative singles. Alternate standard sets of an exercise with negative singles. Or perform the standard version of the exercise in a morning workout, and negative singles in the evening workout. Handling supra-maximal weights is a great way to build confidence with heavy loads and can take your strength to new levels. But be cautious of using them too frequently and burning yourself out. 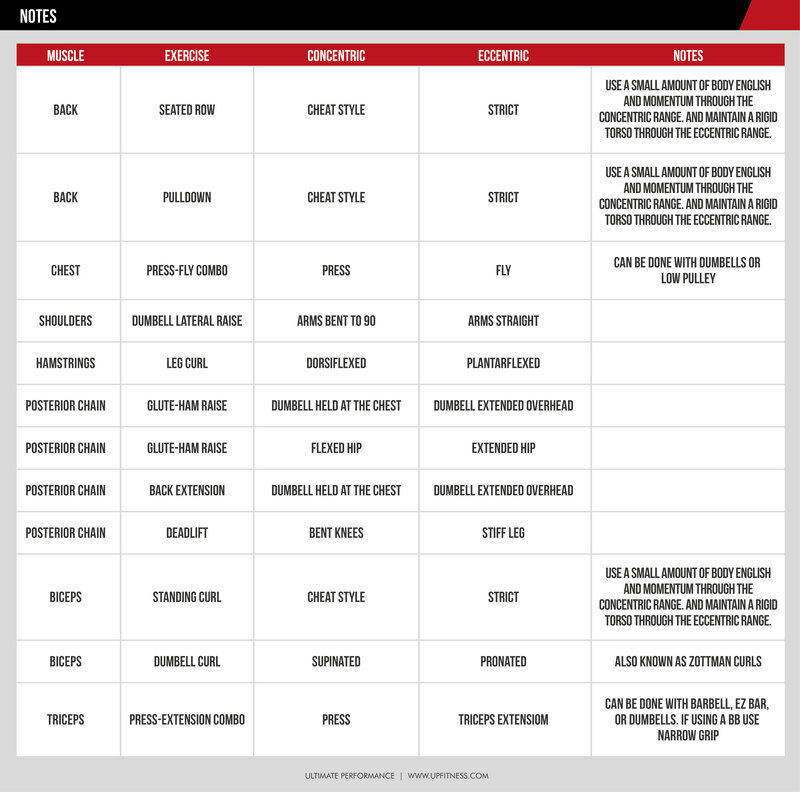 Most of the methods discussed here are advanced and should be reserved for seasoned lifters. Some of the techniques require more training partners and set-up time. But history has shown us how effective these methods can be when implemented properly. Consider the lengths Bob Peoples was willing to go to achieve a 725 lb deadlift at a bodyweight of 180 lbs. Peoples was using eccentric training in the 1940’s. He had to go as far as using a tractor lift to help get the weight into place to perform his negative reps. But the dedicated lifter always finds a way.